The Prime Minister, who was on a whirlwind tour of Assam, Arunachal Pradesh and Tripura was speaking at Changsari, about 35 kms away from Guwahati—the venue for setting up the All India Institute of Medical Science (AIIMS)— said this while addressing a huge public rally. “There are some sons and daughters of India who were left outside the country during the partition. They thought that situation will improve in those countries later. However, they have endured enough torture there and if they want to come back to India due to their faith, it is the responsibility of India to accept them,” said Modi. “The Citizenship (Amendment) Bill is not for Assam and Northeast. It is for those who were left out during the partition and became minority in Pakistan, Afghanistan or in Bangladesh. However, I am here to assure you that the Bill is not going to harm Assam and other northeastrn states,”he said adding that a misinformation is being spread by a section for their petty benefits. 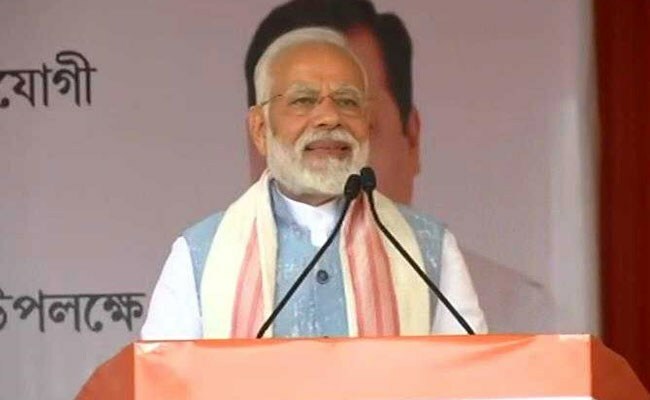 Attacking the Congress, the Prime Minister said that the previous governments in Assam have failed to implement the Assam Accord for over 30 years. The Prime Minister also attacked the Congress for failing to confer the Bharat Ratna to music maestro Late Bhupen Hazarika and said that it is the BJP government at the Centre who has conferred Bharat Ratna to Dr Hazarika and Gopinath Bardoloi. “We would all be happy if Dr Hazarika walk up to the state to receive the country’s highest civilian honour. However, the honour was delayed by decades both in case of Dr Hazarika and Bardoloi,” he added. “I want to ask them why is it that the real jewels has to wait for decades to be recognized as Bharat Ratna while for some the honour was fixed immediately after their birth,” said the Prime Minister. The Prime Minister also highlighted the development initiative taken by the BJP government in the last five years and said that the central government is committed for development of the Northeast.